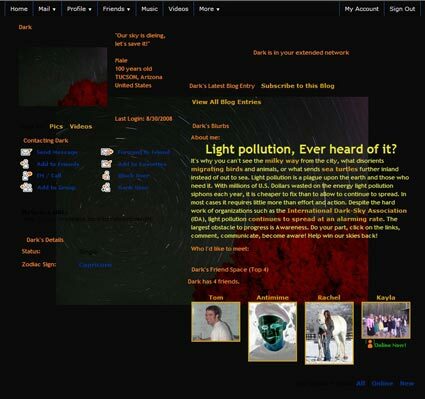 My Space “Turndownthelight” and Facebook “Save the Night!” webpages were developed specifically to generate interest in providing a different type of approach to spreading information about light pollution and its negative effects upon our planet. The wepages were also developed to promote the International Year of Astronomy 2009 (IYA2009). 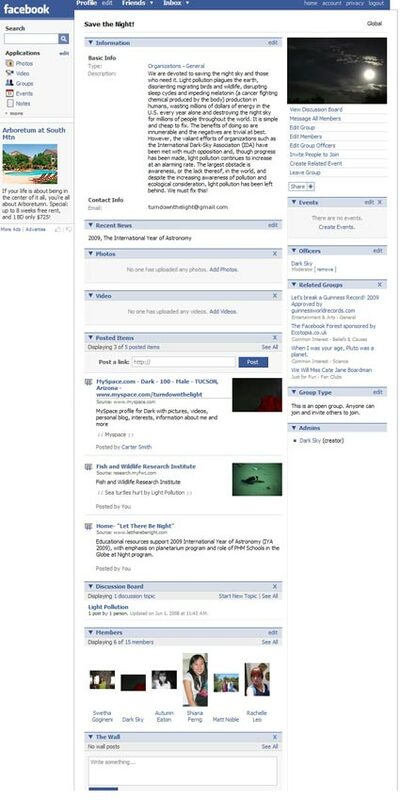 To reach an audience that may otherwise be missed, MySpace and Facebook webpages were designed to target an audience of kids and young adults. The general idea of these sites is to promote and develop conversations between young people about the effects of light pollution. These on-line conversations allow for communication in a style with which most young people are already engaging and are comfortable. Such on-line access is also able to engage young people who may never previously have heard of IYA2009 or of light pollution. It is hoped that these webpages will promote awareness about light pollution and generate interesting conversations that young people may use to explore the phenomena and ramifications. Such sites also have the potential for providing encouragement throughout the world to young people who become interested in astronomy and concerned about the negative effects of light pollution. Young people interacting on these sites have potential for creating a lifelong interest in astronomy and in reducing all types of negative implications and effects of light pollution on our planet. So, it is hoped that this increased awareness and interest will generate energy for life changes that will extend beyond the moment. Often when young people become interested and concerned about issues, they communicate those concerns to the adults with whom they interact and to the local peers with whom they associate. Thus, we are hopeful that increased learning and concern regarding light pollution will be generated by school personnel, parents and other adults who associate with the young people interested in these My Space and Facebook webpages. The URL to use to reach the My Space page and hyperlinks to access more information are listed below. On My Space, people can “friend request” the page and send information to other friends on My Space. The Facebook group is set up so that anyone with a Facebook can view and join the group. People in the group can post questions and information on the group page. This will help those interested in light pollution connect with others who want to fight it as well as have their questions answered and provide resources to inform them and assist in generating ideas.